After the massive sugar overload that is Halloween, I made these in hopes of having something other than mini chocolate bars to toss in Jake's lunch box. They are supposed to have a buttery, sugary crumble topping but I wanted Hubs to be able to eat them so I left it out. 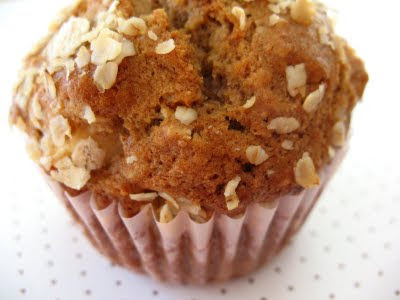 Since the muffin itself isn't very sweet at all, I imagine a topping of brown sugar, pecans and flour would have made it over the top delicious. Try them! They are a great way to use up some apples you might have rolling around in the fridge. Pre-heat your oven to 375 F, and line your muffin tin with paper liners. In a large bowl, whisk together the flours, oatmeal, baking soda, baking powder, cinnamon, and salt. Set aside. Whisk the milk, vegetable oil, egg, brown sugar, and vanilla together in a separate bowl. Stir in the apple pieces. Pour it all into the bowl with the dry ingredients. Stir together just until everything is moist and blended. Set aside. In a small bowl, stir the topping ingredients together. Set aside. Spoon the muffin batter into the paper lined cups and sprinkle with topping. Bake in the center of your oven for about 20-25 minutes, or until a tooth pick inserted into the center comes out clean. Let them cool in the pan for about 5 minutes before removing them to a rack to cool completely.